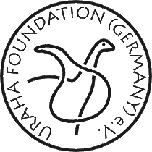 Applications of Uranium – URAHA Foundation Germany e.V. in lamp filaments. 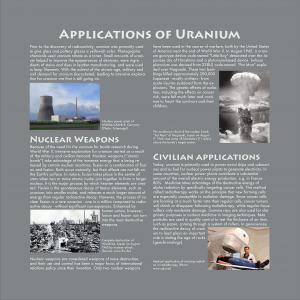 With the advent of the atomic age, military and civil demand for uranium skyrocketed, leading to intensive exploration for uranium ore that is still going on. Because of the need of uranium for bomb research during World War II, intensive exploration for uranium started as a result of the military and civilian demand. Nuclear weapons (“atomic bomb”) take advantage of the immense energy that is being released by certain nuclear reactions, fission or a combination of fission and fusion. Both occur naturally, but their effects are not felt on the Earth’s surface. In nature, fusion takes place in the centre of stars when two or more atomic nuclei join together to form a larger nucleus. It is the major process by which heavier elements are created. Fission is the spontaneous decay of heavy elements, such as uranium, into smaller nuclei, and releases a much larger amount of energy than regular radioactive decay. However, the process of nuclear fission is a rare occasion – one in a million compared to radioactive decay – without significant consequences. Enhanced by human action, however, fusion and fission can turn into the most destructive weapons. 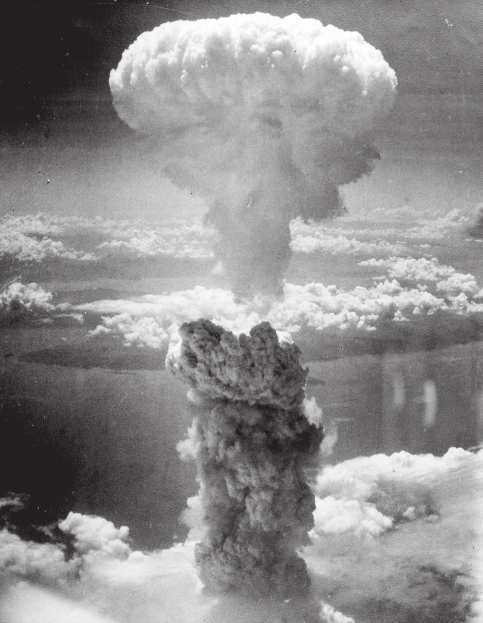 The mushroom cloud of the nuclear bomb “Fat Man” of Nagasaki, Japan on August 9, 1945 rose some 18 kilometers (11 miles) above the bomb’s target center. Nuclear weapons are considered weapons of mass destruction, and their use and control has been a major focus of international relations policy since their invention. Only two nuclear weapons have been used in the course of warfare, both by the United States of America near the end of World War II. 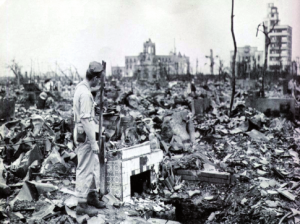 In August 1945, a uranium gun-type device code-named “Little Boy” detonated over the Japanese city of Hiroshima and a plutonium-based device (whose plutonium was derived from 238U) code-named “Fat Man” exploded over Nagasaki. 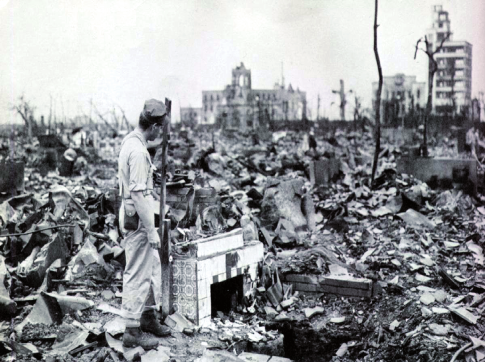 These two bombings killed approximately 200,000 Japanese – mostly civilians – from acute injuries sustained from the explosions. The genetic effects of radiation, including the effects on cancer risk, were felt much later and continue to haunt the survivors and their children. Today, uranium is primarily used to power naval ships and submarines and as fuel for nuclear power plants to generate electricity. 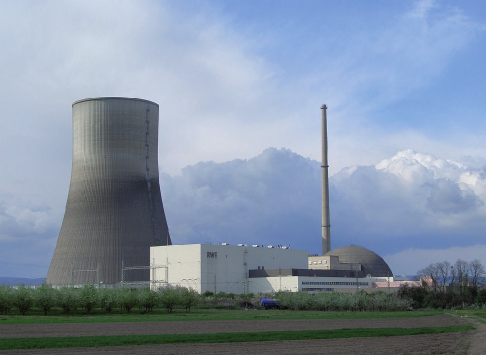 In some countries, nuclear power plants contribute a substantial amount of the overall electric energy production, e.g. in France 80%. Medicine takes advantage of the destructive energy of alpha radiation by specifically targeting cancer cells. This method called radiotherapy works on the principle that new forming cells are especially susceptible to radiation damage. 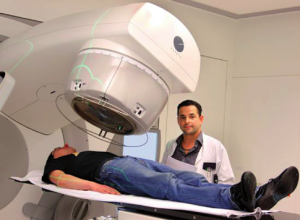 Since cancer cells are forming at a much faster rate than regular cells, cancer tumors will shrink or disappear following radiotherapy, while regular tissue suffers only moderate damage. Gamma rays are also used for diagnostic purposes in nuclear medicine in imaging techniques. Beta particles are used in quality control to test the thickness of an item, such as paper, coming through a system of rollers. In geosciences, the radioactive decay of uranium to lead plays an important role in dating the age of rocks (geochronology).